When you stand out the front of Parliament House and look at the iconic building with the Australian flag proudly waving on top, there is more to see than meets the eye. The building has its own secrets and courtyards to discover within, however it is around the back the building where beauty awaits. If turn to your left and take a stroll clockwise along Parliament Drive, around the outside perimeter of Parliament House, a hundred metres or so along the road you will find a large open double gate. Just inside are two white stone lions guarding the entrance, which were gifts from the Government of the Peoples Republic of China. These two hand carved lions are a good way to let you know when you have found the gardens, because although the gates are open - there is no sign to tell you where to go or where you are. 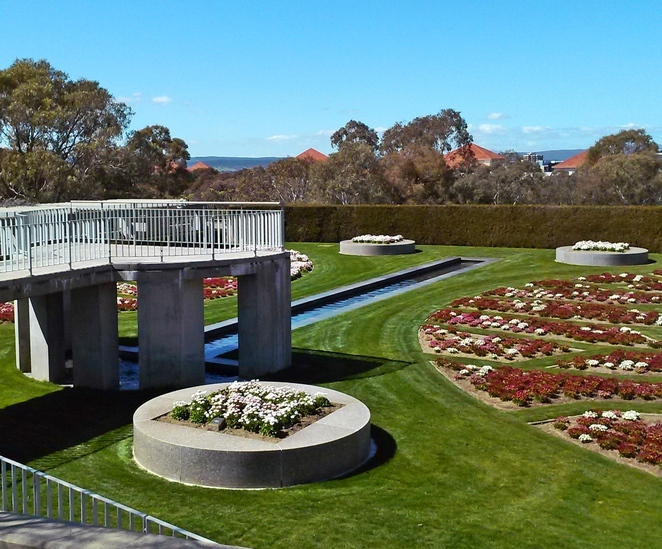 Rest assured these gardens are open to the public, however it is mainly used for weddings, events and for government workers to have a quiet moment for lunch. Also known as the Eastern Gardens, these formal gardens are a surprise to stumble upon and there is a good chance that you will have them to yourself on your visit. 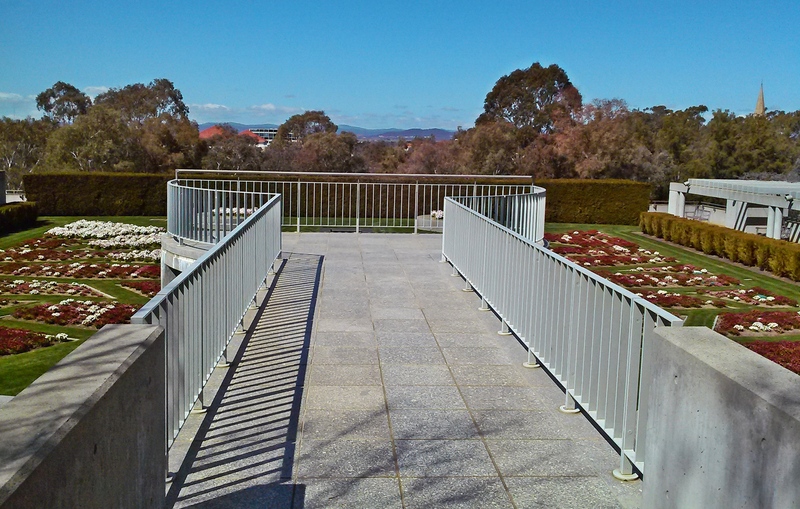 As you walk in, there is a walkway that leads out onto a viewing platform, so you can take in the whole floral spectacular down below. 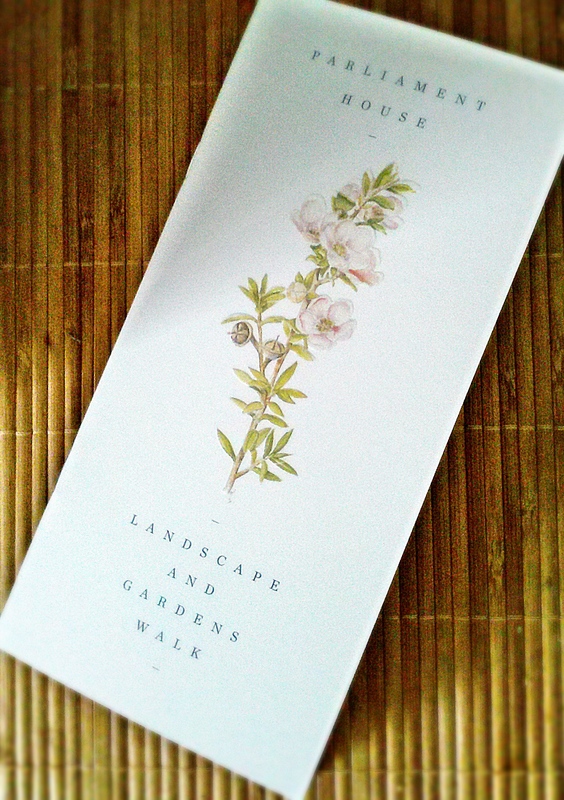 There is a long, thin water feature that leads your eye directly to the view beyond, then around at the colourful flower beds in full bloom. 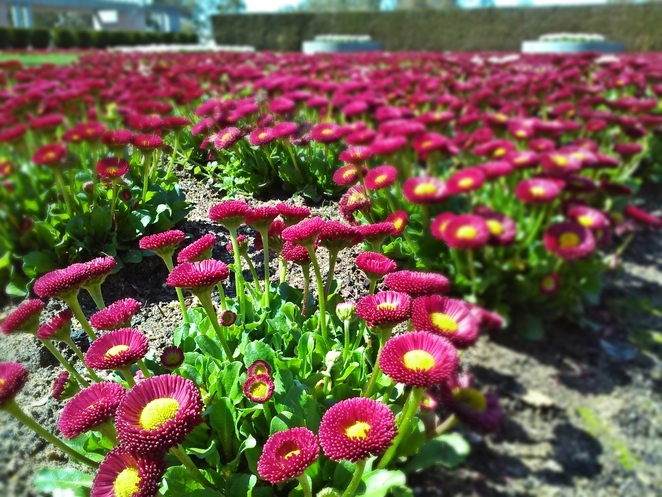 Spring is when this formal garden is utilised the most for wedding ceremonies and formal occasions, however it is open all year around with flowers blooming in every season. The floral displays in the gardens are changed at least twice a year, with the summer display planted mid to late October and the winter display planted mid to late March. On our visit in mid September the cherry trees, which were a gift from the Government of Japan, weren't in blossom however if you arrive in October they should be in their full, colourful display. On either side of the walkway there are ramps to lead you down to the soft grass and you can walk around the beds and also look back to admire the vision of the gardens, with Parliament House behind. 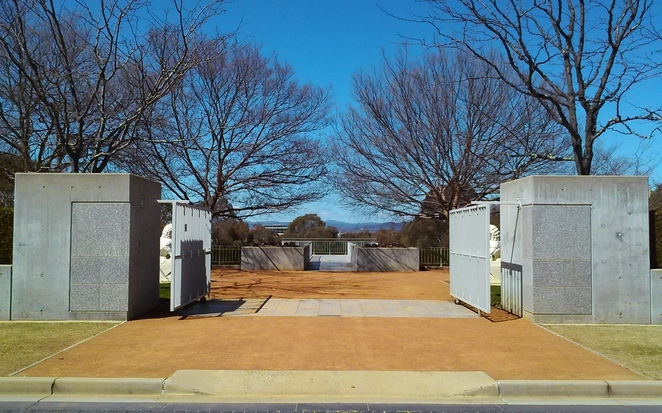 Along both sides of the perimeter there are bench seats so you can sit and enjoy the gardens with your lunch, or just have a rest and enjoy the view. The formal gardens are based on English and French formal garden design and are lovingly looked after by the horticulturists who work for Parliament House. In the wings of this main formal garden, there are also side gardens which host their own floral displays and sculptures. Back up on the top level, there are two gardens either side of the main entrance. One side has a wooden, circular sculpture called Compass and Perspective, by Howard Taylor. 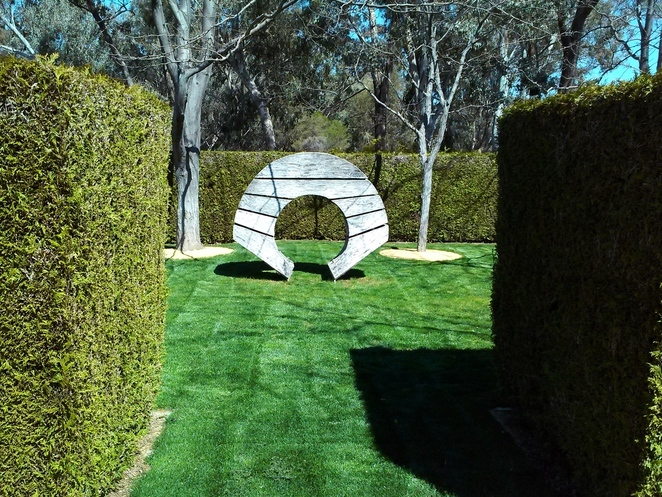 This weathered sculpture takes pride of place in the centre of the hedged courtyard. 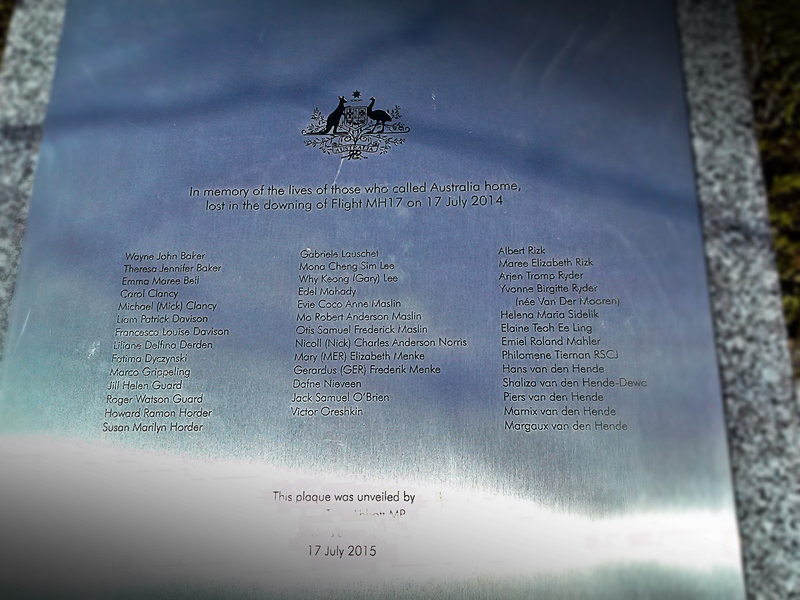 On the other side are two memorials - one to the Australians who lost their lives in the Bali Bombings of 2002 and another to the Australians who lost their lives on the Malaysian Airlines flight MH17, which was shot down over Ukraine in July 2014. If you decide to continue on your walk around the back of Parliament House, which you can do, it is an interesting stroll past tennis courts and various carparks used by staff and politicians. Workers from inside the building are often seen pounding the pavements in their lunch breaks to get in some exercise, all under the watchful eye of the Australian Federal Police cars that occasionally drive by. 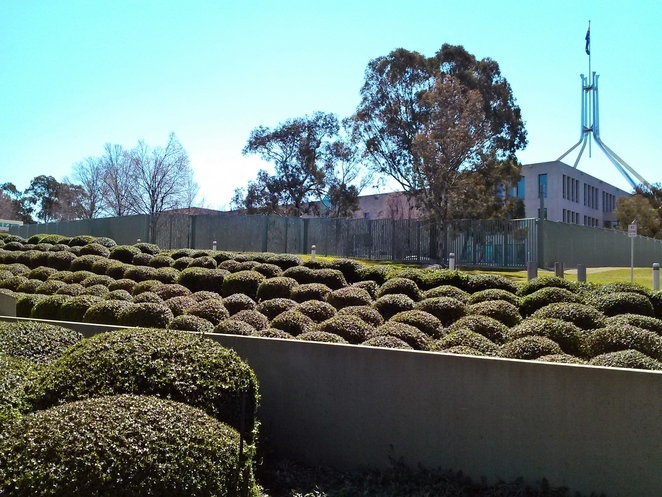 You will also see a variety of hedges and other formal gardens along the way that compliment the iconic building behind. 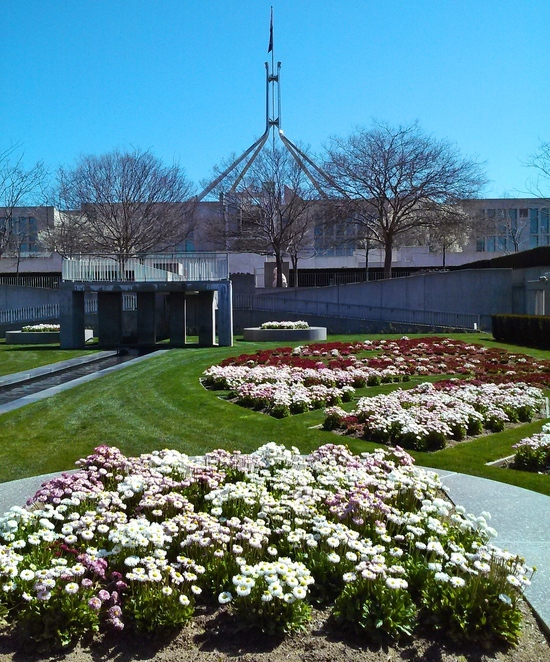 If you want to explore these outside areas in more detail, then pick up a Parliament House Landscape and Gardens Walk booklet ($3) from the Information Desk inside, to learn more. Although not technically a secret garden, these gardens aren't advertised or widely known about, so you need to do some legwork to find them. 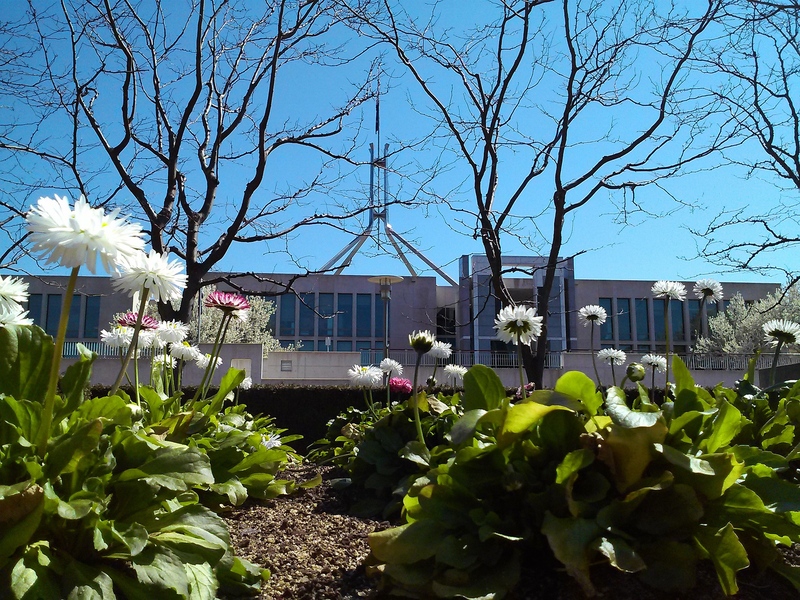 Spring is the ideal time to visit these gardens, so why not park the car under Parliament House (with two hour free parking) and get your walking shoes on for a walk around Australia's most iconic building. At different times of the year you will discover something new, so if you are local, it can be a place that you can enjoy all year around. 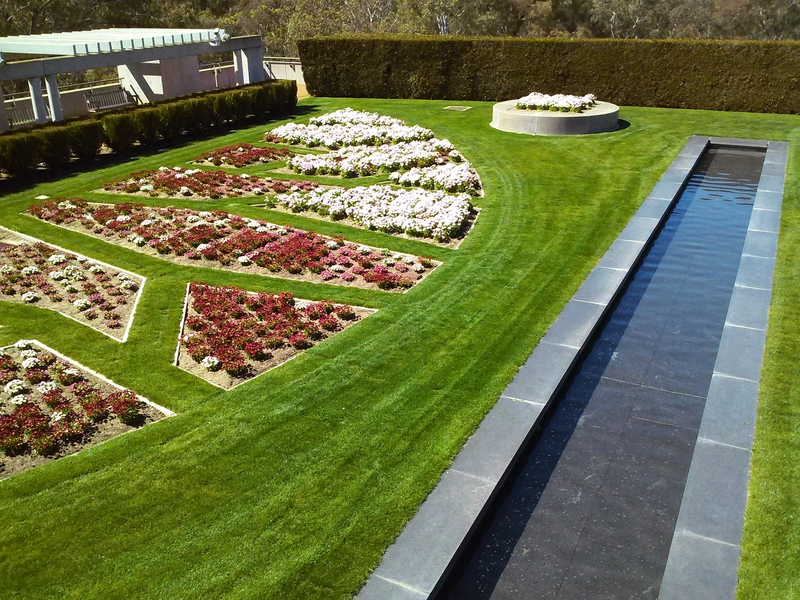 These gardens are simply spectacular, with a quiet aura about the area which makes you slow down and simply appreciate their beauty in the sunlight. Whenever you decide the visit, the flowers in the House of Representative Formal Gardens are a burst of colour, ready to be discovered. A good find Sue, you seem to be quite the explorer. What a beautiful area, Sue - well-deserved Gold!